I do love my living room. 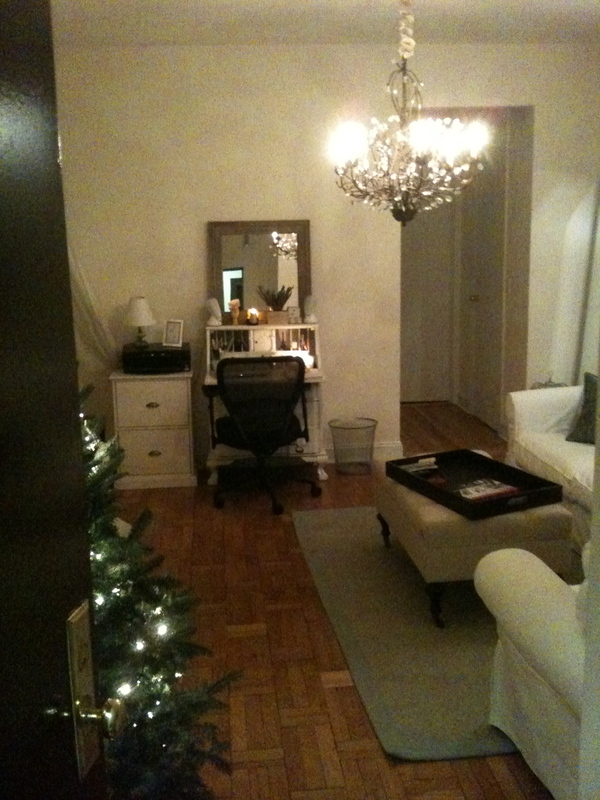 Despite some faults (sloping floor, only window is in the corner), it’s a good-sized space. 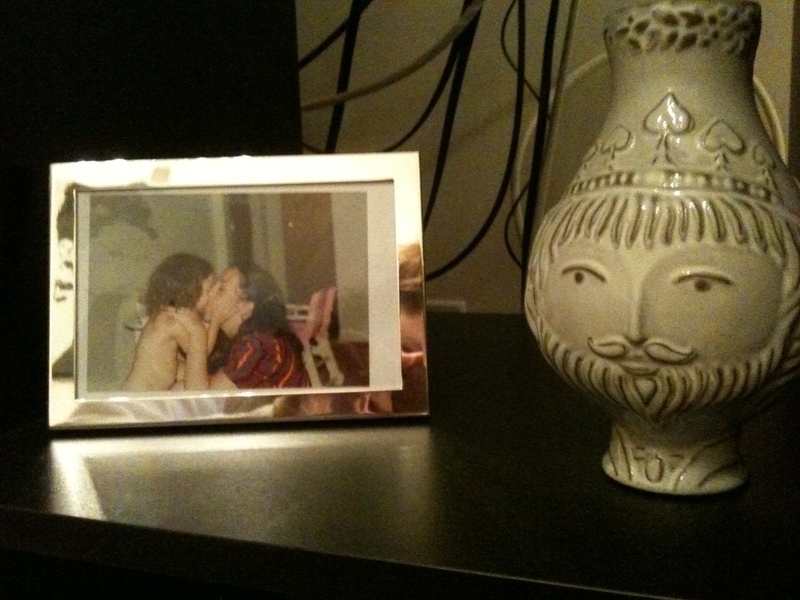 A few friends have commented that my living room looks like it was art directed. That’s what 10 years of HGTV, movie sets, and an addiction to Domino Magazine (RIP) does to a girl. 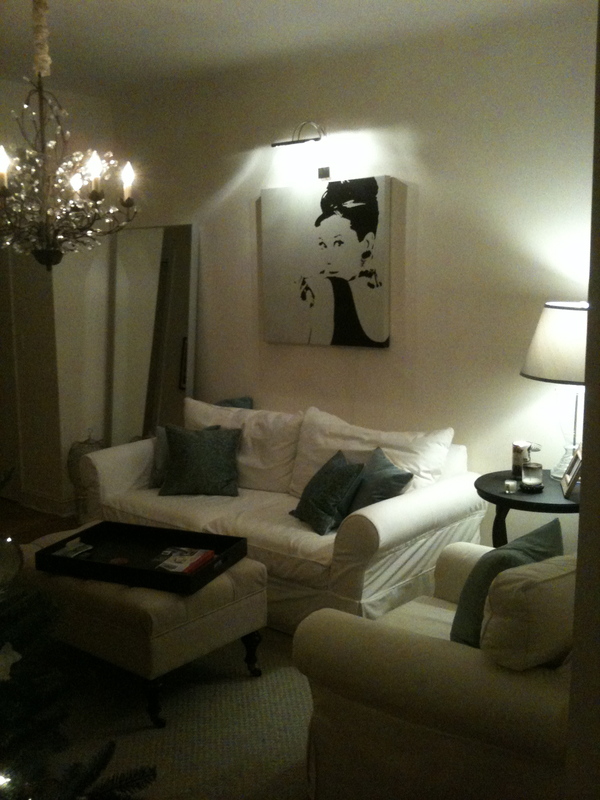 Audrey Hepburn canvas print was a gift from my grandmother (Ikea, $50 No more Audrey, but they have Garbo!). Light over picture is also from Ikea ($4). Couch is Pottery Barn ($1100 with a discount). 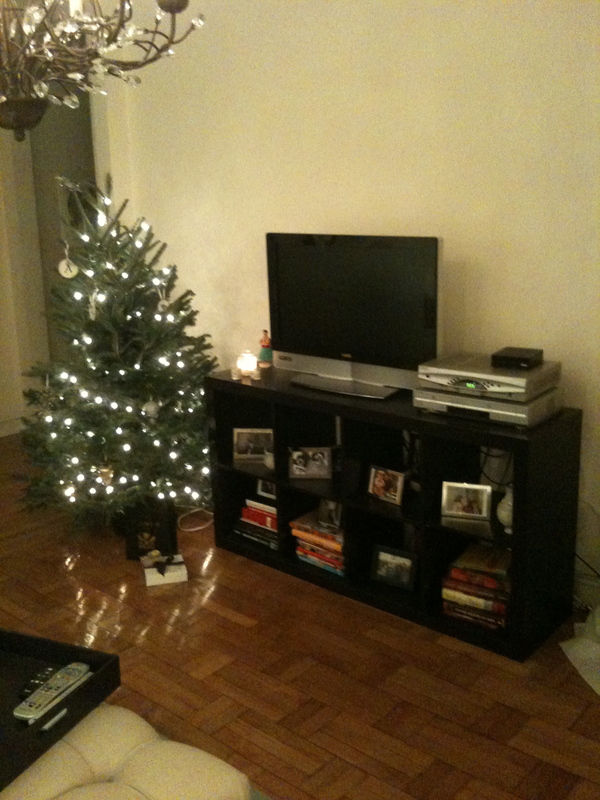 Yes, pricey, but after two Ikea couches that arrived with smashed wood frames, it was time to upgrade. The PB Comfort line lives up to its name and beyond. Fun fact: Pottery Barn couches are manufactured by the same company as the Mitchell Gold + Bob Williams sofa. Essentially, you’re getting the same quality couch for about half the price. 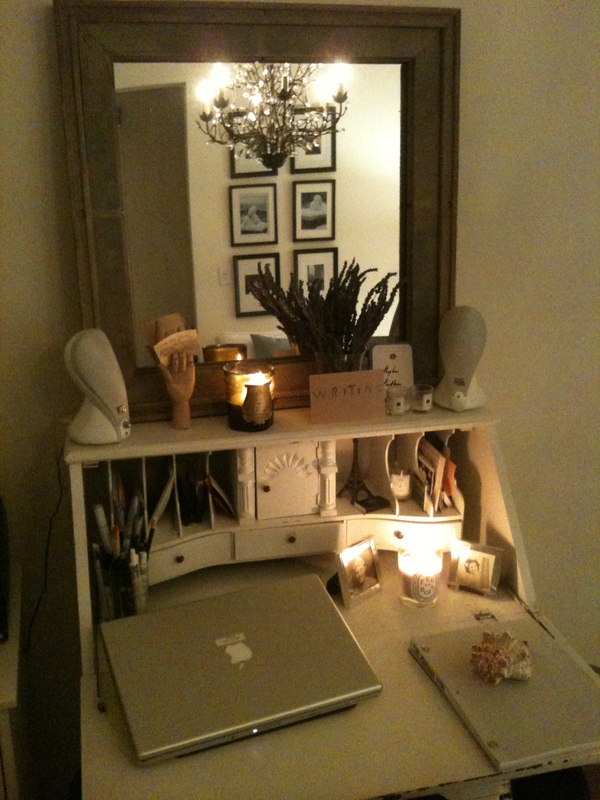 Mirror is a hand-me-down from my sister (Ikea, $99). Throw pillows on my couch were pilfered from my parent’s basement, but solid blue velveteen pillow covers from Pottery Barn (sale, $10 ea). Patterned blue silk pillows Tracy Porter (I stalked them for a year till they went on sale from $150 ea to $35 ea). Rug is also Pottery Barn ($250, but got it on sale for $195). I had this rug in blue first, but it shed unbelievably. This one is a chenille and jute mix, so it’s flat enough for the wheels on my ottoman, but comfortable enough for floor seating and does not shed. Vizio TV is from Costco ($200!! 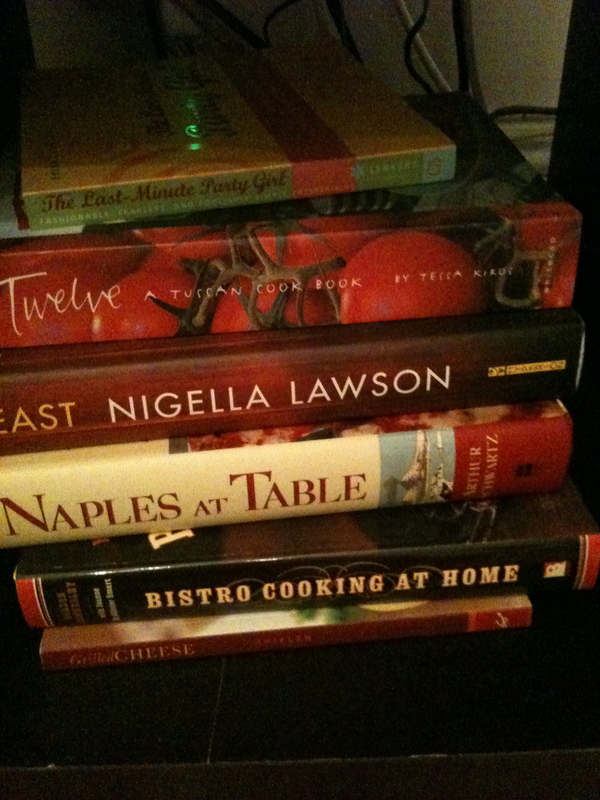 ), as is Sony DVD/VHS player left over from my days at the Rachael Ray Show (free with work reimbursement). Roku (little black box) is most genius invention ever ($50). Black storage shelving thing is actually an Ikea bookcase turned on its side ($70). 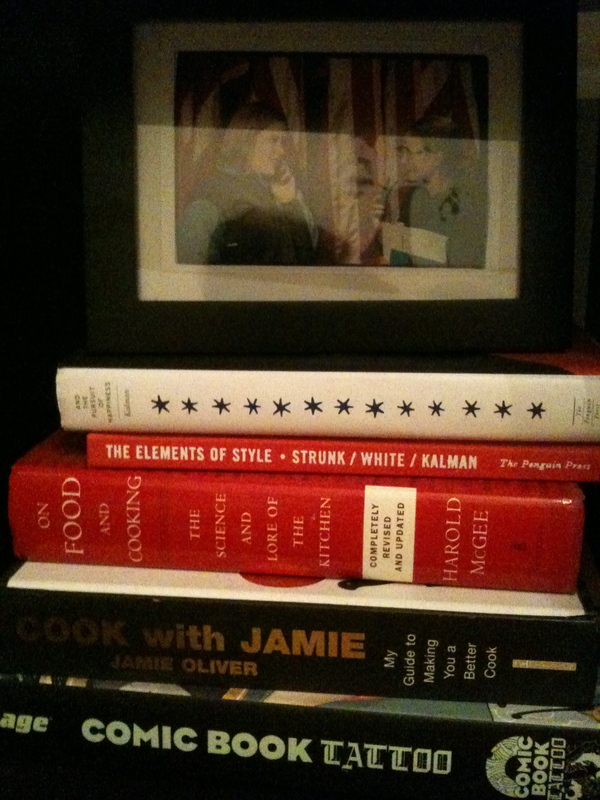 Here are a few close up shots of the items on the shelves. 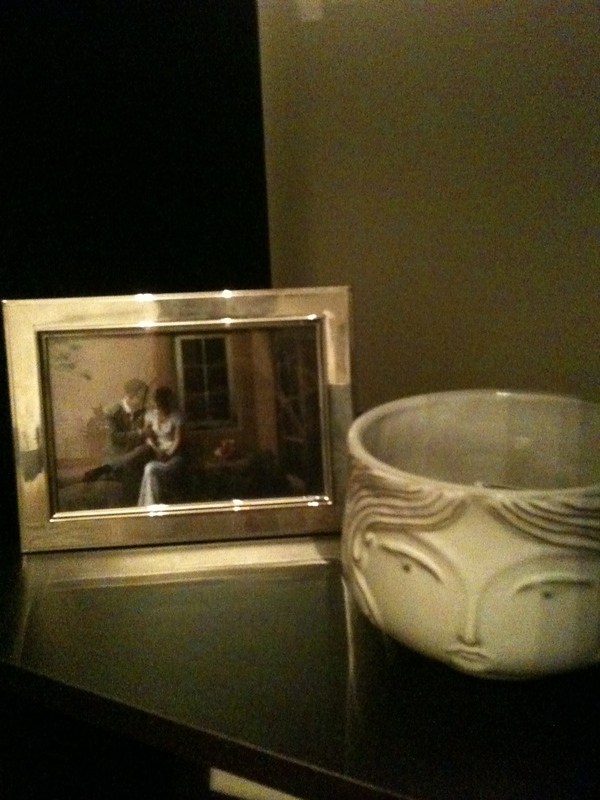 Pottery on shelves is from Jonathan Adler’s Utopia collection, all gifted from friends and family. I love J.A. Chair is from Ikea ($349) but I scored it at a set sale for $100 and bought the white slipcover for it (Ikea, $29). Pillow on chair is from Home Goods ($12). 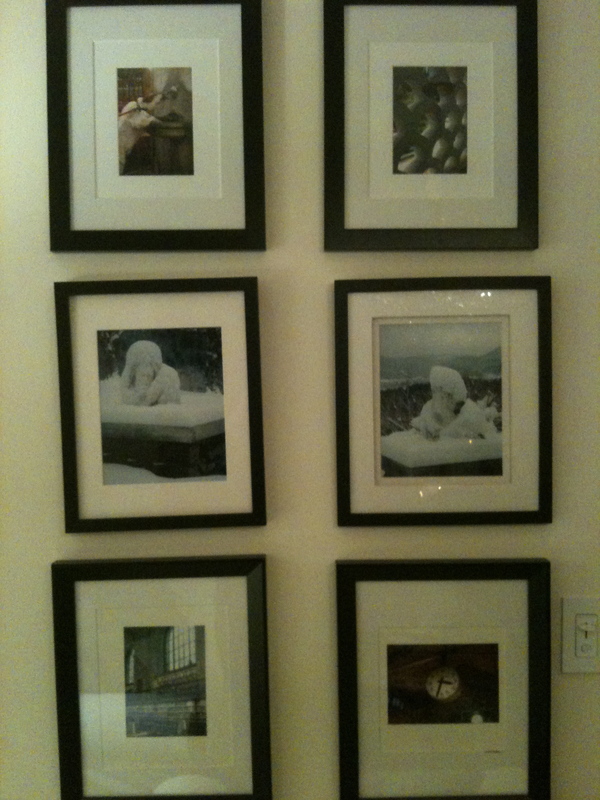 Photos on wall are from my travels. Frames are Ikea. 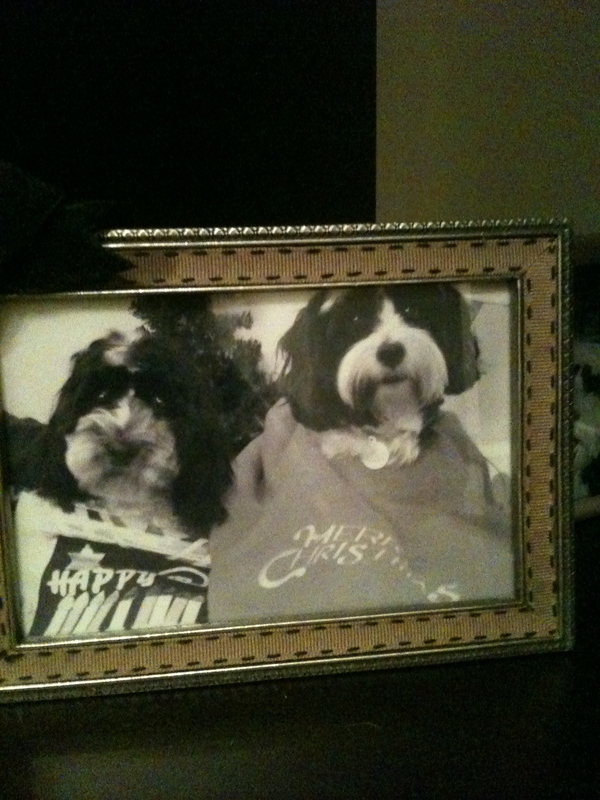 Here’s a close up of the pictures. I’m slightly obsessed with my ottoman/coffee table. I spent four years searching for the perfect one. In New York, you never know if your next apartment will be bigger or smaller, so all the furniture I own was bought with the thought it might one day need to perform double duty as something else, or it was snagged from my parent’s basement where it could easily be returned. 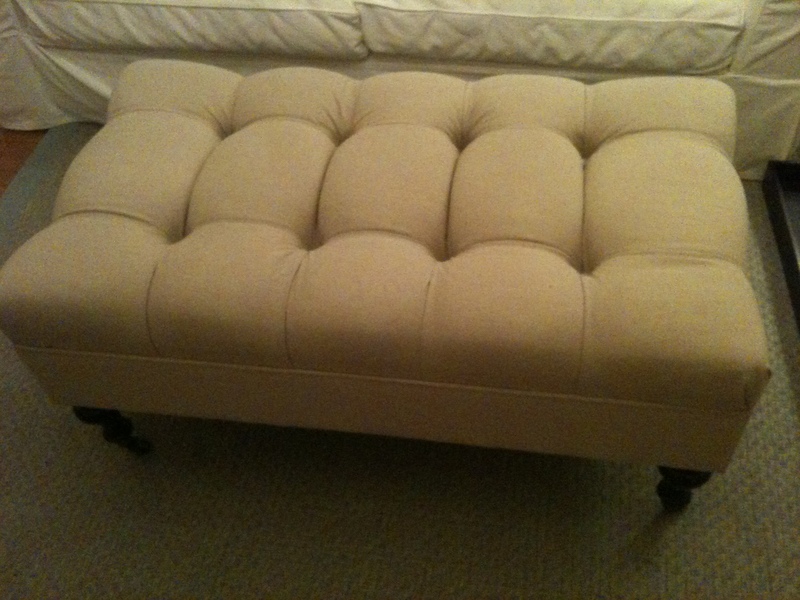 The ottoman doubles as a coffee table, additional seating and storage. Apart from the couch, it’s the most expensive purchase in my apartment. It’s a custom piece from Ballard Designs ($420, with coupon). It took me a year to work up the courage to spend that much money on something design-related, but it was worth every penny. Watch how beautifully it closes! I told you, obsessed! 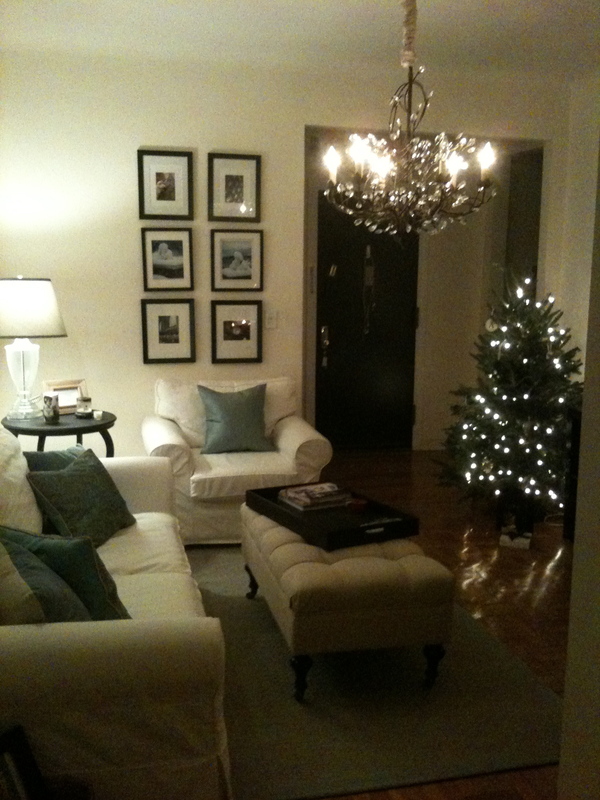 The chandelier is also from Pottery Barn ($275, with friends & family discount). Another purchase that took me a year. It also took me three hours to screw all of those crystals in each arm. 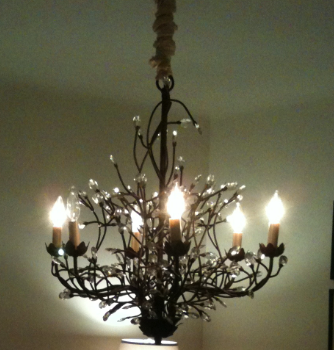 In the end, I think the chandelier makes the room. This is my primary workspace. My parents brought home this desk from an estate sale when I was 11 years old. 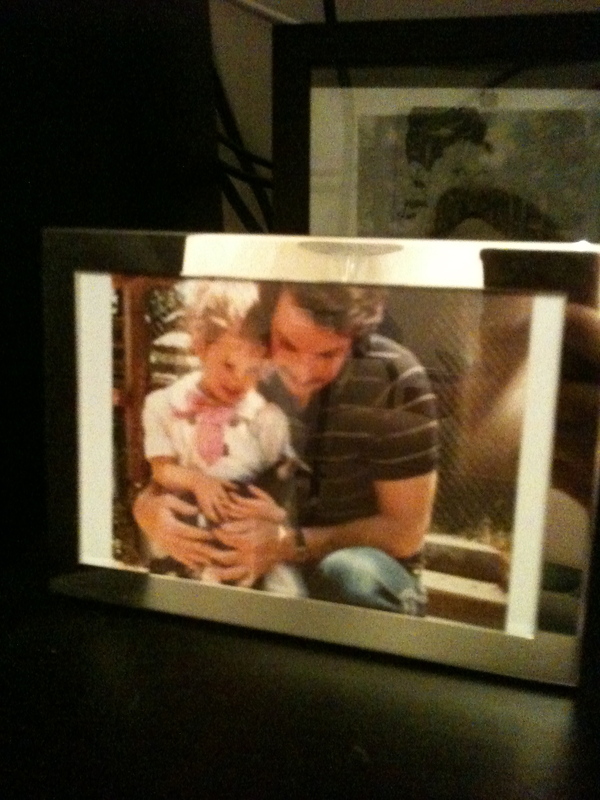 They bought it for my sister’s room, but I had my eye on it from day one and was determined to make it mine. 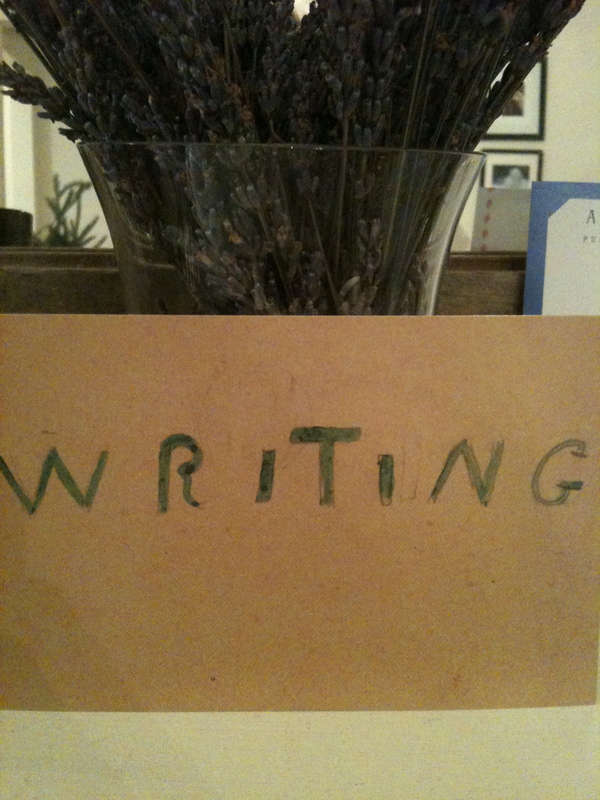 When they were striping and painting it, they came across a folded piece of paper, it was a limerick about the desk from “Herman the Poet.” We, of course, saved the poem. The only thing I did to this desk was swap out the drawer pulls on the three drawers (not pictured) with glass ones from Anthropologie ($12, ea). 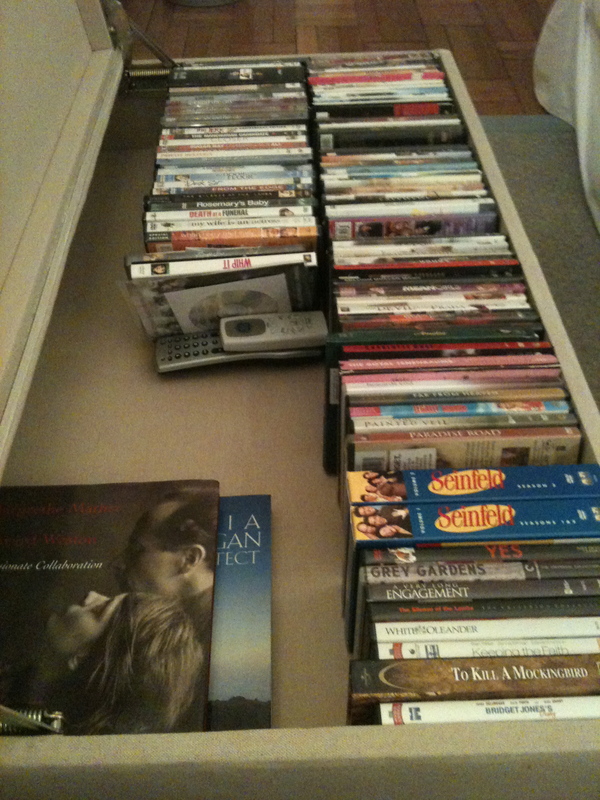 I don’t recommend the ones I purchased if you have drawers that stick, as they break easily. I scored the mirror from the “It’s Complicated” set sale ($40, incredibly heavy to haul back from Brooklyn). Candles from Aedes De Venustas (stupidly expensive habit; $60 ea — but cheaper & less harmful than cocaine! 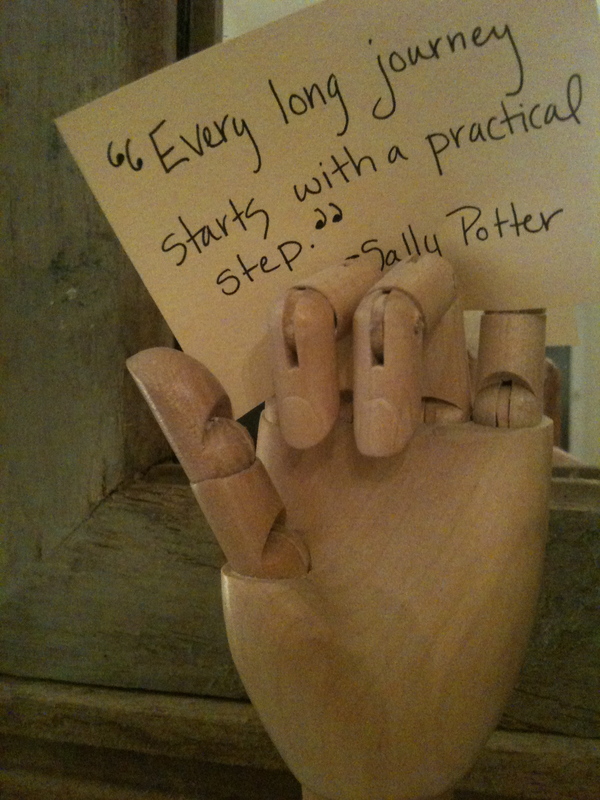 ); “Writing” postcard is from John Derian ($1.50); wooden hand (Lee’s Art Shop, $5) The hand holds one of my favorite quotes, from the film director Sally Potter: “Every long journey starts with a practical step.” So true, Sally, so true. 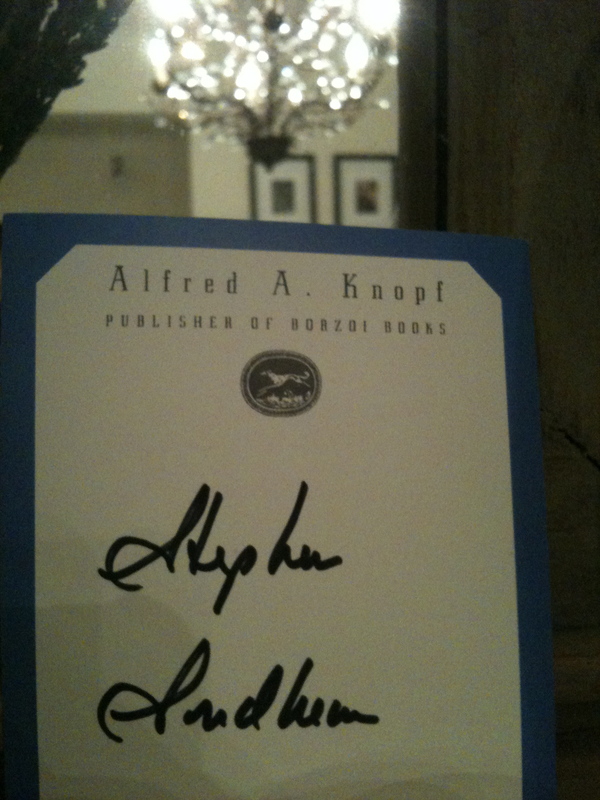 Oh, and the Stephen Sondheim autograph = free (but PRICELESS!) 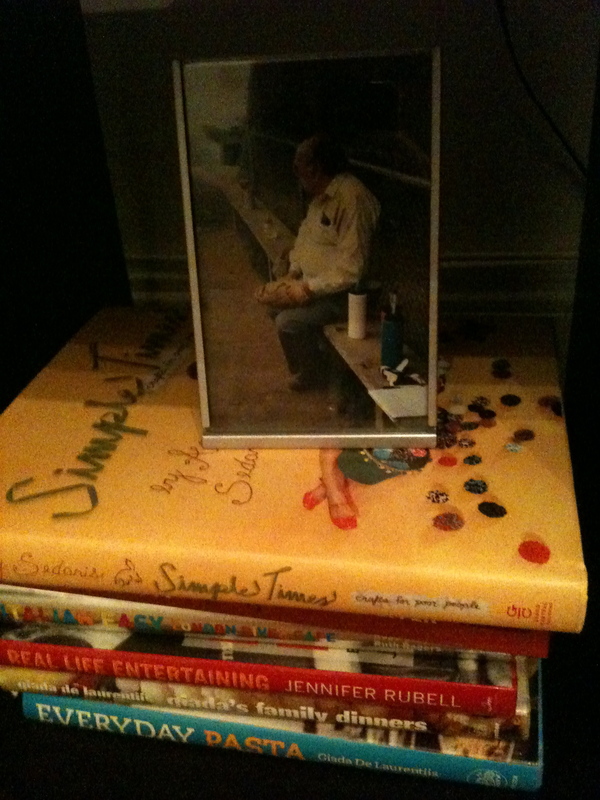 as is the framed index card from Lynda Barry. Not pictured here: Ergonomic chair from situpstraightforcheap.com or something ($120). I originally intended for the birdcage (Etsy, $40) to be turned upside down and used to cover an ugly light fixture in my bathroom, but it might hang a little low in there, so I placed it here for now. 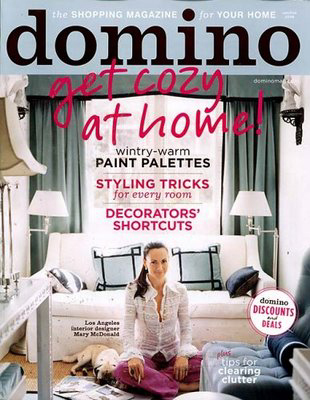 The soft jute basket (West Elm, $39) holds my collect of Domino magazines and some plays. 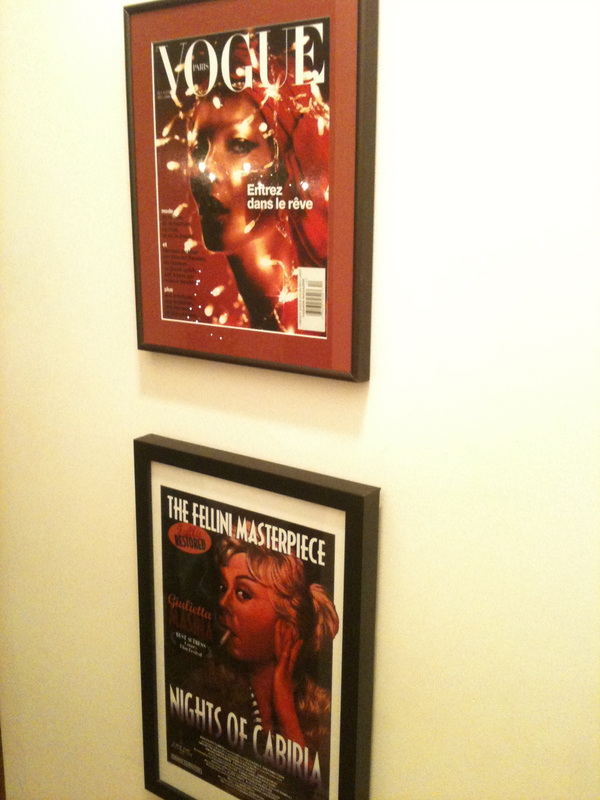 I placed the framed vintage program (free, from the Maysles!) from the Paris Theatre premiere of Grey Gardens back in 1976. It felt fitting to pair with the birdcage. 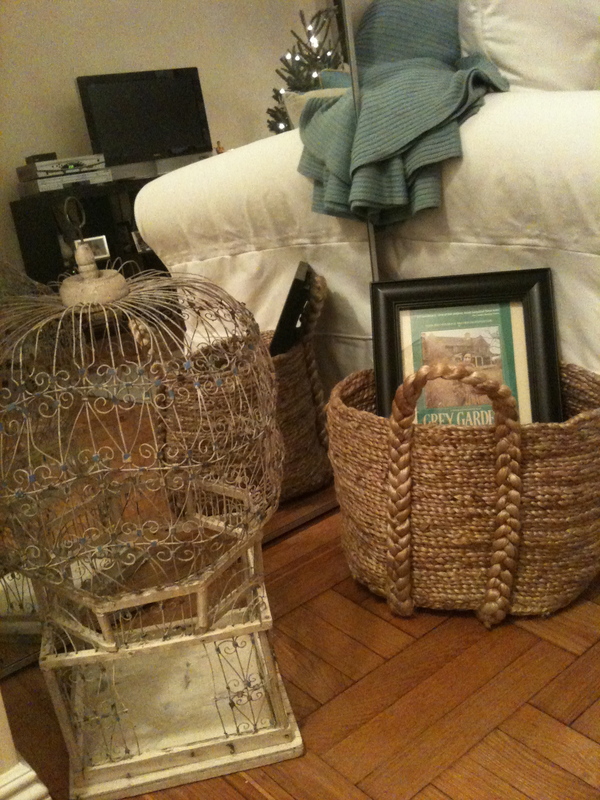 By the way, it took two years to find the exact soft jute basket I wanted. Two years. I am aware of my craziness. Blue throw blanket on sofa is from Pottery Barn (discontinued; was on sale, softest blanket ever, $25). 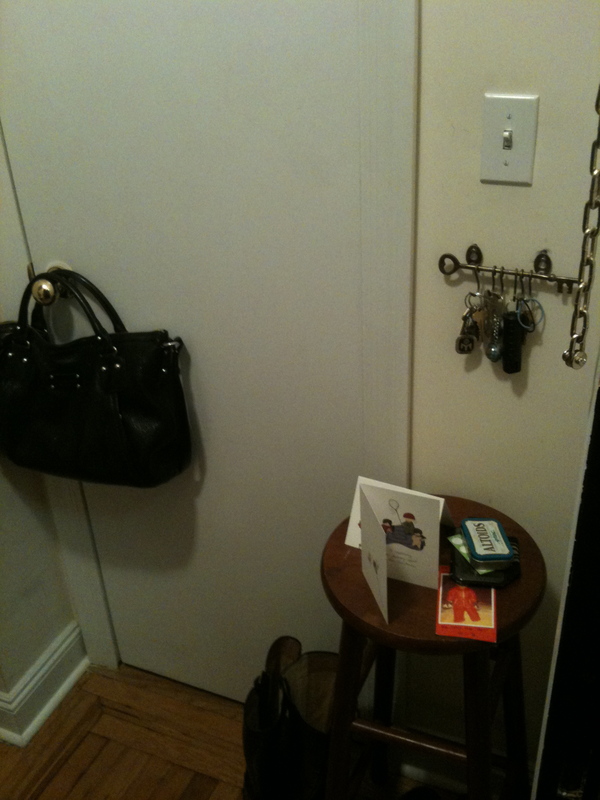 Lastly, I’ll take you back to the corner where the couch and chair meet and cuddle up to my end table. Another find in my parent’s basement (free!). It was originally red, but I painted over it with a flat black. I don’t recommend flat black paint. It attracts every speck of dust in the room. 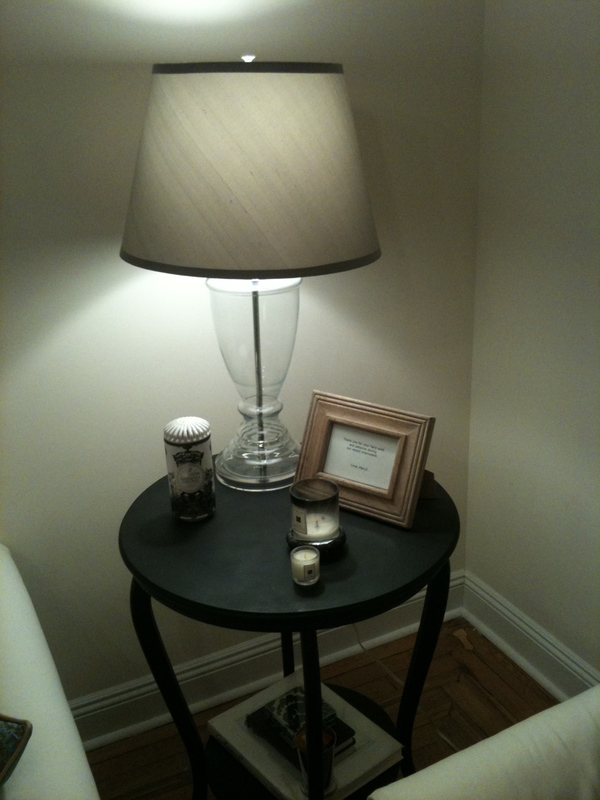 The lamp base is from Target (on clearance for $11!) and I scored the Restoration Hardware silk lampshade from the “Lipstick Jungle” set sale for $15. 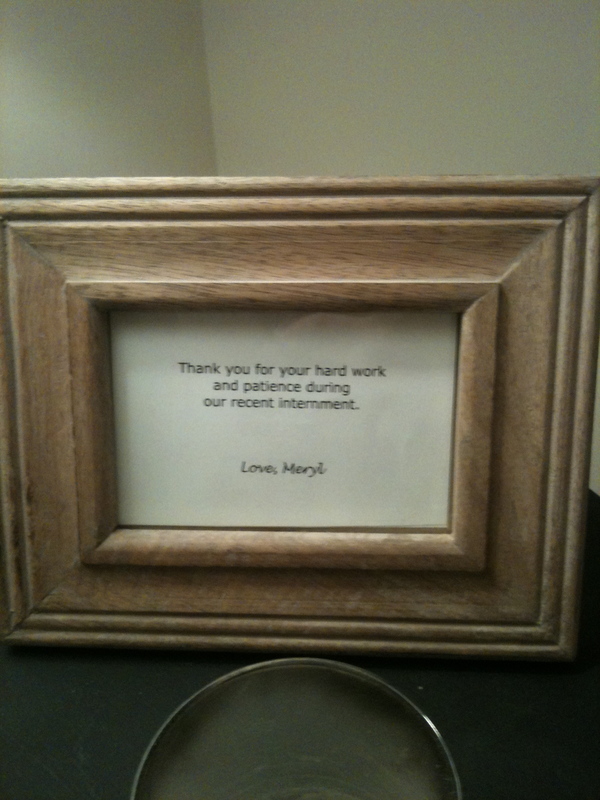 The wooden frame (free) is the companion piece to my “It’s Complicated” mirror, also from the set sale. Message in the frame is priceless & hilarious. Close up pic here. 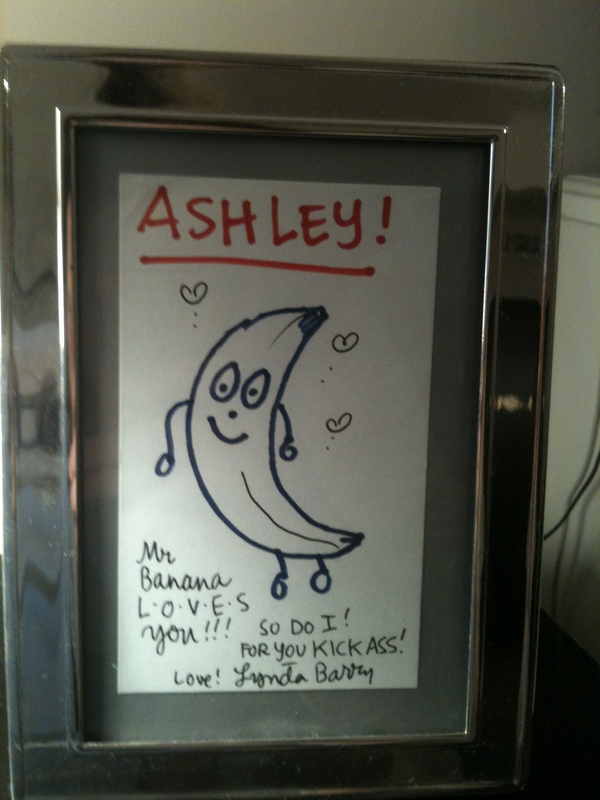 And yes, it’s from that Meryl. Lastly, WAIT. If you can’t find it right away or can’t afford it right away, wait until you find the right thing or the price drops. Patience is everything. P.S. If you have a challenge in the room, like I do with my corner window, find the positive in it and work with that. I needed light. My window (sort of) provides me with some light, but I look almost directly into my neighbor’s living room and a corner window is just so awful. I bought the paper shade at Bed, Bath & Beyond for $30. It diffuses the light and is thick enough that I can’t see my neighbors. 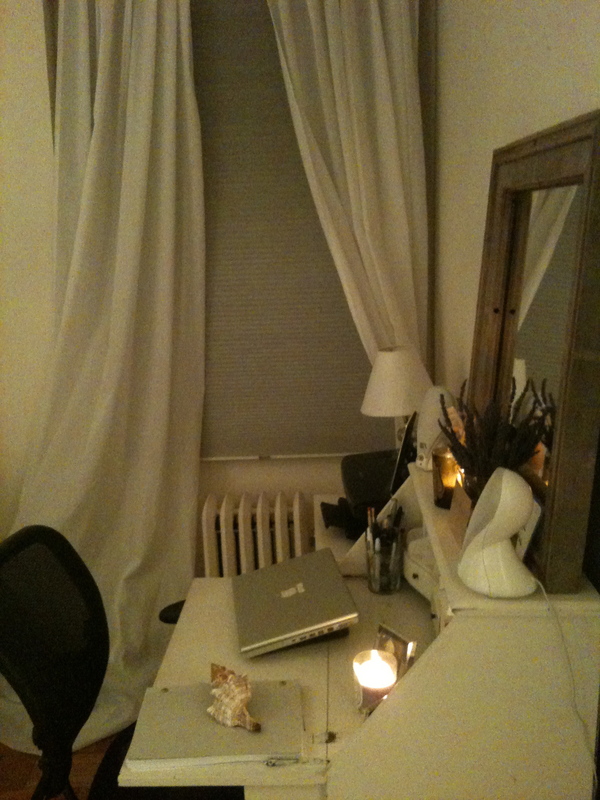 I also hung two thin, white panel curtains I first saw in Domino Magazine used to remedy a similar problem (from Ikea, $16 for set of 2) to finish the look & draw your eye up to the height of the room. I left the curtain bottoms un-hemmed, they hide my computer cord, power strip, and modem behind the billowing bottoms. The apartment tour will conclude on Tuesday with the bathroom and bedroom. Stay tuned!